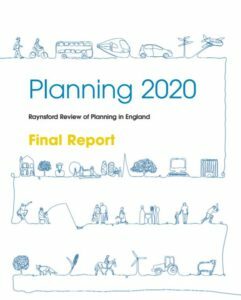 At the end of November, the TCPA published Planning 2020: the final report of the Raynsford Review of Planning in England. The report includes some excellent recommendations but will they change policy on consultation in planning? The Review warns that planning has been reduced to a ‘chaotic patchwork’ of responsibilities which is not compatible with promoting the health, wellbeing and civil rights of communities. It finds significant deficiencies in community involvement, which, it states, is ‘incompatible with the basic principles of democracy’ and in which ‘people’s involvement in planning is no longer characterised as due process but as delay’. More specifically, it cites social media, ‘fake news’ and well-resourced campaign groups (the cause of ‘a toxic political environment’) as being barriers to sensible debate, along with ‘a lack of support services for communities on planning applications and Local Plans’, the power of developers to exploit and dominate the planning system, complex language and procedures, a lack of community engagement skills among planners, unequal legal rights which reinforce the perception of a system constructed to benefit applicants, anger that decisions seemed to ignore community concerns and anger at the perceived ‘purchase of planning permission’ through Section 106 agreements – among others. It also states that blanket descriptions of the ‘public’ or ‘community’ can mask the diverse and sometimes competing needs and aspirations of complex social groups. a new professional culture and skills set directed at engaging communities. a legal obligation to plan for the needs of future generations, by, for example, the consideration of resource use. Improved public awareness of planning, through harnessing the benefits of new technology, redirecting resources to general planning advisory services, establishing a community planning portal to act as a hub of community resources on planning, work with the Department of Education to embed planning skills in the national curriculum as a key part of citizenship, and harnessing the resources of the planning schools to support community understanding and empowerment. On behalf of the Consultation Institute, I am working increasingly closely with the TCPA on strengthening community involvement in planning. I was recently asked to attend a roundtable discussion on Empowering Communities to Participate in Planning for New Communities and have been involved in the drafting of a new TCPA guide People, Planning and Power which is published in March 2019. Additionally I have offered its support to the TCPA in a variety of areas, including the drafting of new covenant for community participation and code for consultation in planning, advice on how to restore the disconnect between planning and people and in overcoming apathy. We hope that over time more developers and planning consultants will use tCI membership to raise standards in planning consultations. Whether Nick Raynsford’s recommendations are taken on board very much depends on how political events play out over the next few very uncertain weeks. But there is certainty in that these are constructive recommendations which have the potential to transform both attitudes and outcomes people’s role in planning. This article was first published by The Consultation Institute on 7 December 2018. A summary of the elements of Planning 2020 which concern consultation and community involvement can be found here.